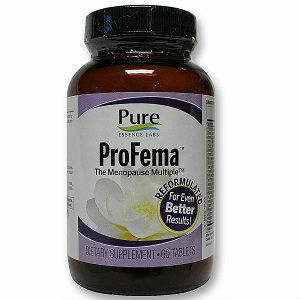 Pro Fema is an all natural product that has been indicated (by the manufacturer) for the relief of such menopausal symptoms as moodiness and hot flashes as well as the many other common symptoms that occur as a result of the drop in estrogen output caused by menopause. These symptoms include: Hot Flashes, Night Sweats, Fatigue, Insomnia and Mood Swings. Vitamin D3- Vitamin D3 has shown insufficient evidence in studies done to prove that it can do anything to help with the symptoms of PMS. Vitamin B12– Vitamin B12 has nothing to do with relieving the symptoms of menopause or reducing them. Vitamin C– Vitamin C can not help you with any of your menopause symptoms, it has nothing to do with menopause. Bioflavonoids- Bioflavonoids have insufficient evidence proving that they can actually help with depression. Chaste Tree Fruit-Chaste Tree Fruit can help relieve symptoms of PMS. The recommended dosage for Pro Fema is 4 tablets each with a meal and a glass that is full of water. Throughout all of the research we have done for this project, we have found that the product Pro Fema does not have any listing on their website for price. Though they do not state the how many days you have to return it, Pro Fema comes with a guarantee that says that if you are not satisfied with the results, you can return the portion of it that you have not used for a complete refund. Pro Fema only uses one ingredient that has been medically shown to have positive effects on menopausal women, and it does not list their price, meaning that if you want to know how much you paid for your bottle, you would have to look at your credit card statement. It also has quite a high recommended dosage as well. Jackie Horowitz	reviewed Pure Essence Labs Pro Fema	on July 28th	 and gave it a rating of 2.5.